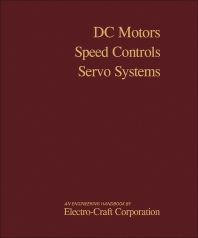 DC Motors - Speed Controls - Servo Systems: An Engineering Handbook is a seven-chapter text that covers the basic concept, principles, and applications of DC and speed motors and servo systems. After providing the terminology, symbols, and systems of units, this book goes on dealing with the basic theory, motor comparison, and basic speed control methods of motors. The subsequent chapters describe the phase-locked servo systems and their optimization and applications. These topics are followed by a discussion of the developments made by Electro-Craft in the field of DC Brushless Motors. The final chapter provides revised data sheets on Electro-Craft products and describes the models in the motomatic range of speed controls, servomotor controls, and digital positioning systems. This handbook is of great value to professional engineers and engineering students.